This is one of the most sought-after brokerage services, since transferring funds to be managed by one or more professional traders, who receive remuneration as a percentage of profits, is an effective tool for passive earnings for investors, ensuring a substantial protection of their capital. 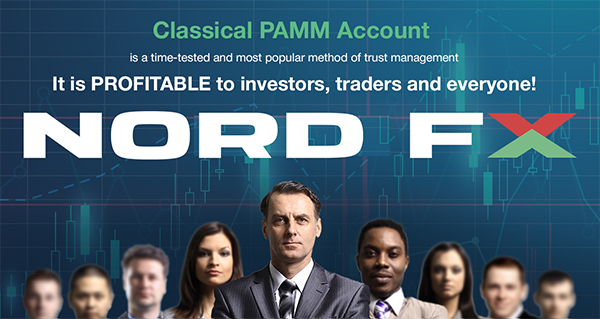 NordFX PAMM service offers some of the best terms in the market as well as a wide range of trading tools available on Pro and Zero accounts, including 33 currency pairs, metals, 15 crypto pairs, 4 crypto currency indexes, and CFD contracts for major world stock indices and oil. Trading is carried out on the MetaTrader-4 platform. The maximum leverage available on PAMM accounts is 1:1000. The minimum non-withdrawable amount of the manager’s own investments is $50. There are no requirements from the company for investors, and the managing trader determines the minimum amount for investments, as well as other terms, in his offer. You can learn more about the principles of the PAMM-service in the Trader's Cabinet in the “Investment Products” section at https://account.nordfx.com/account/pamm/ . You can also open a corresponding account there by registering as a manager or as an investor.